I have heard of how the sandwich, chocolate chip cookies, ice cream cones, potato chips, and popsicles (ice lollies, if you’re UK-born) are a mistake, but the nachos one is a new one. I also have heard that the naming for “chimichangas” was a mistake, as it was from a Mexican mom who was trying to cover up her cursing in front of her child. Another culinary mistake that became popular was the chocolate lava cake. According to food legend, a pastry cook took out a batch of mini chocolate cakes too soon, but since he was in a hurry, he just told the customers that they’re a new dessert made by the kitchen. Creating accidental foods is how I got through some of my culinary classes, like that tomato-flavored cream cheese that I tried to pass for dip (goes great on bagel sandwiches, especially ones with lox or smoked salmon. Not so much the greasy breakfast sandwiches where sausage, ham, a sunny side-up egg, or bacon is your protein). 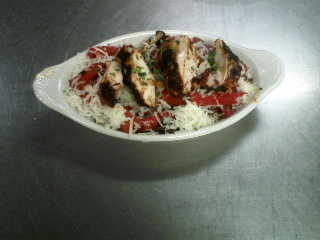 Or that Mexican cheese and chicken dish I did in Chef Wagner’s Bistro class that I made after I successfully made sopas (pictures below). 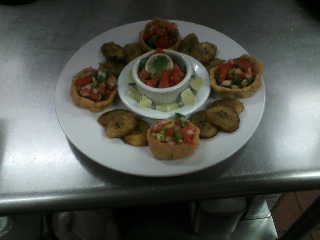 This is the sopa platter, decorated with fried plantains, some salsa (homemade, natch), and lime pieces (with kosher salt on them for that bold, sassy virgin margarita flavor). Now, if memory serves me correctly, this was made with roasted red peppers, queso fresco, roasted chicken, and refried beans. You can eat it like a cheap casserole or use it in filling for tacos, quesadillas, or homemade Hot Pockets or mini-pizzas. Thank you, and happy eating! They say that necessity is the mother of invention. I think accidents are the father. Sandwich – The Earl of Sandwich was at a gambling table and didn’t want to get up. I’ve been there and know that feeling. He ordered his dinner of meat to be brought to him between two slices of bread. Chocolate Chip Cookies – A baker at the Toll House Inn (yes, that Toll House) was making chocolate cookies one day and ran out of chocolate powder. Taking a bar of semi-sweet chocolate, she broke it into chunks and put it into the batter, thinking that the chocolate would melt evenly. It didn’t and thank God for that! Last time on Take Back the Kitchen, we looked at the history of barbecue and some regional differences. Today, we’re going to look at how you can have a barbecue in your own house if you don’t have a barbecue grill, if the weather is too damp or cold to cook outdoors, or if you’d rather not like your meat burnt from charcoal or gas flames. The best crockpots are the ones for today’s busy idiot (no disrespect to anyone who’s busy or an idiot. It’s just that, in this quick-fix world we live in now, that’s the only way I can describe people who are slaves to wanting things done easy rather than putting a little effort behind a task, and that kind of mentality knows no skin color, ethnic group, religious preference, sexual orientation, body size, gender, or physical/mental disability) — the kind where you can set your ingredients in there and let it cook low and slow until tender (usually anywhere from 3 to 8 hours, depending on how tough your cut of meat is and what you’re cooking). Crockpots are what pressure cookers were back when they were first in vogue (I’m going to assume the 1950s. While pressure cookers are still around, they’re not as popular as they used to be…unless you’re a terrorist or have an old pressure cooker your grandmother or mom used to use and you want to keep up tradition): a big pot people can use to make thick,stews (especially beef stews), boiled dinners, and pot roasts and not have to worry about getting actively involved with what’s being cooked. Basically, it has the same emotional arc as a drama about a parent who abandoned his or her kid(s) in the past and is trying to get back in the child(ren’s)’s life (lives): starts out cold, but warms up very slowly, and you can expect a lot of boiling and steam. Much like Kleenex, Chapstick, and Kool-Aid, “Crockpot” (actually spelled “Crock-Pot”) is actually a brand name that has come to generically describe the product. Crock-Pot’s claim is that it’s the original and everything else is a pale imitation, and I applaud them for taking pride in their work, but for those who don’t have the money for an authentic crockpot go for brands like Hamilton Beach (which is said to have a lot of good products that won’t put a hole in your wallet). But let’s save the kitchen appliance chatter for a later day. We’re here to talk about crockpot barbecueing. Crockpot-barbecuing meat is no different than braising (in fact, it’s a close relative of it). Both cooking techniques involve tough or large cuts of meat being cooked in a liquid (in this case, a thin, Carolina-style barbecue sauce, but you can use a less thick, Kansas City-style barbecue sauce if you’re making pulled pork for a pulled pork sandwich) after being browned for color and flavor, either in a brazier (a specialty pot used specifically for braising), a saucepot, a Dutch oven pot (if you’re not serving large groups of people), or a crockpot. The main difference between crockpot barbecueing and grilling is that there’s no fear of your meat coming out dry and burnt, since you’re utilizing a moist-cooking technique. Slow cooking — be it with crockpot, brazier, or Dutch oven — touches on that want for warm, filling meals, especially in the winter months when no onereally cares about their waistline expanding. While others will tell you you can use a crockpot any time of the year (say, if you want to make chili for a summer barbecue), it’s the winter months in which slow cooking shines. Does beef stew appeal to you more when its ten below or 75 degrees and balmy? Optional ingedients for this include peas, beans, bacon, mushrooms (white button), and frozen mixed vegetables (my mom uses canned and frozen vegetables because they cook faster and she doesn’t like to futz around with fresh vegetables, e. For a barbecued beef stew, we use either a bottled barbecue sauce or make a quick version using ½ cup tomato paste (or ketchup), ¼ cup brown sugar, few squirts of Louisiana hot sauce, some cayenne, and molasses to taste. Always remember that the times listed are just suggestions, depending on what you use for slow-cooking. You may need more time; you may need less. I’m going by how my family makes this. Combine beef, celery, carrots, onion, potatoes, salt, pepper, and stewed tomatoes in a crock pot (my family uses a six quart, since that’s enough to feed the four of us and have leftovers for the next few days). Cook on low for 6-7 hours, eight at the most. About 30 minutes before serving, add water and seasonings. For a thicker stew, add ¼ cup of flour and enough vegetable oil to make a roux out of it. The roux is ready if it tastes more oily than floury. Mix until well-combined and let simmer for another 30 minutes. I also find that this tastes great when put in a hoagie roll and eaten as a bastardized version of a roast beef au jus sandwich. You really should try it this way. Happy holidays and happy eating. While searching for a recipe for mee krob (a deep-fried noodle dish from Thailand) online, I discovered that today is Onion Ring Day. It got me thinking about my past encounters with this staple of the appetizer menu. I don’t think I’ve ever had a good experience with onion rings. Most of the onion rings I’ve had were from the freezer section (Ore-Ida) or from greasy spoon restaurants, which puts my experience with them either at the average to “Nothing to write home about” level (and the one time I had “from-scratch” onion rings, it coincided with an adverse reaction to fried shrimp initially thought to be a seafood allergy. I don’t know about you, but I can’t enjoy onion rings while my stomach is trying to reject semi-digested shrimp in response to the rest of my body thinking that it could be poisonous). I gave onion rings a change years later when I was a Basic Culinary Arts student at Whitney M. Young Job Corps center — and once again, I was disappointed. Not because my stomach objected (far from it. I also found out that fried onion rings are more than just a member of the “Not Ready for the Main Course” players along with chicken fingers, mozzarella sticks, and jalapeño poppers. 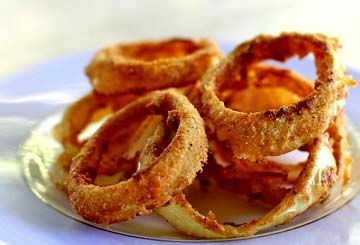 Properly-made and seasoned onion rings can go on to substitute for French fries on a delicious hamburger or be enjoyed solo), but because the cooking technique that is frying is very flawed, especially when it comes to frying vegetables (particularly onions and mushrooms). More often than not, onion rings are a litany of common frying mistakes: they come out soggy, doughy, heavy, and/or raw, with the “soggy” and “raw” problems a common occurence I’ve experienced in eating amateurly-made onion rings. How many times have you bitten into an onion ring only for the golden ring and the actual onion split on you like a girlfriend or boyfriend who “needs her/his space” (but is really nailing your sister/brother/best friend/worst enemy behind your back)? It leaves you (the eater) disappointed and, in some cases, burned from the hot oil or gagging from eating a raw or undercooked onion. “So, how do I turn onion rings around so that I may enjoy them next June 22nd?” you may ask. Well, it all starts at the core: the onion. Vidalia onions (sweet onions from Vidalia, Georgia) are your best bet. If you can’t find Vidalias, any sweet onion will do, but make sure they’re sweet. White and yellow onions are actually dry, have a stronger flavor, and are better off for sautéing, roasting, and the occasional use as mirepoix for stock. Why sweet onions? Sweet onions offer a milder flavor, and you want your onion to complement, not upstage, the delicate, fried skin of the onion ring. 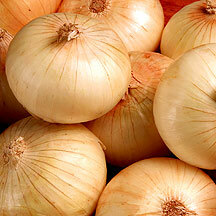 However, if you can’t find any sweet onions or want a stronger flavor, yellow onions can be used. Okay, you’ve solved the easy problem (the perfect onion). 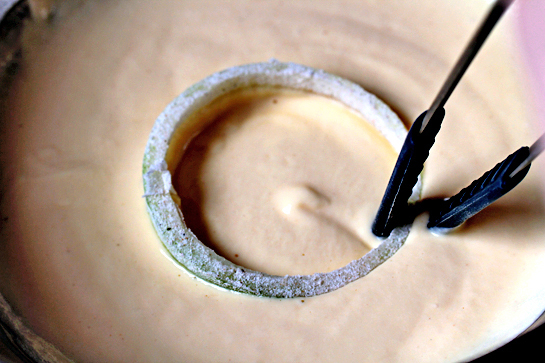 Now you’re at the hard part of creating the perfect onion ring: the batter. In the case of onion rings, I do recommend batter, as the old flour + milk or eggwash combo results in the dreaded slippery fried skin that exposes the limp, soggy onion when you go to eat it. For your batter, you’ll need to combine ¾ cup all-purpose flour, ¾ cups cornstarch, 1 teaspoon baking powder, ½ teaspoon salt, ½ paprika (not necessary, but if you want a bolder color and some spicy kick, then add it), and ¼ teaspoon pepper in a large bowl. Slowly whisk in ¾ cup beer until just combined. If you see some lumps in it, don’t worry; that’s normal. Whisk in remaining beer (the recipe calls for 3 cups of beer, but make it four if you want a quick drink. I won’t tell if you won’t, but make sure you reserve 2 cups of beer) as needed, 1 tablespoon at a time, until batter falls from whisk in steady stream and leaves faint trail across surface of batter. If you’re serving kids or don’t like beer, you can substitute beer for buttermilk. 1) Soak your onion rounds in a bath of 2 cups beer or buttermilk (the two you reserved during the batter-making step), 2 teaspoons of either malt or cider vinegar, ½ teaspoon salt, and ½ teaspoon pepper in a plastic storage bag that can be zipped shut (you know, a Ziplock bag or any off-brand you can find). Refrigerate the bagged bath for 30 minutes or up to 2 hours. 2) Don’t go past the 2-hour mark or your onion rounds will be too soft and and won’t crisp properly. 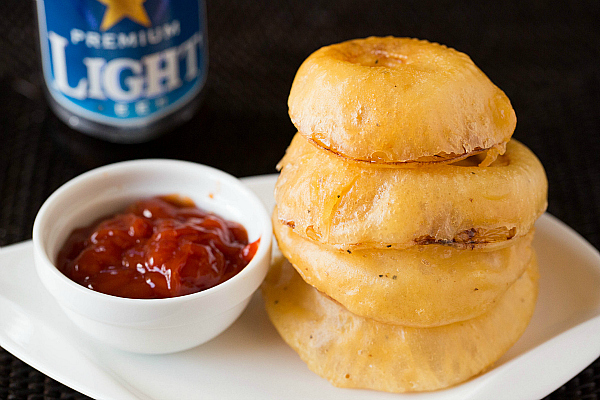 The beer (or buttermilk)/vinegar/salt/pepper bath not only gives more flavor to your onion rings (so the fried skin doesn’t get all the attention. The onion and the cooked batter are in this together to satisfy your taste buds), but it breaks down the exterior cell walls of the onion so you won’t have to worry about chomping down on a raw onion, shortens the soaking time of the onion rounds, and gives a subtle echo to the beer or buttermilk batter, so you just won’t taste the fried batter separately from the onion. 3) Vegetable oil is the best oil to use when frying onion rings (or anything you want fried, like chicken or other vegetables). You can use peanut oil, but only if you’re sure the people you’re serving aren’t allergic to peanuts. 4) Heat the frying oil to 350 degrees Fahrenheit (177 degrees Celsius or 4 on the gas mark), though the average frying range is between 325 degrees Fahrenheit (165 degrees Celsius) to 375 degrees Fahrenheit (190 degrees Celsius) . Use a fat or candy thermometer to measure your oil temperature. If you don’t have a kitchen thermometer, test the oil by sprinkling some flour (or tossing a bread crumb) in the oil. If the flour fizzles (or if the bread crackles and spits), then it’s ready. 5) Be sure your oil temperature is correct. Too cold and you’ll be left with an oily, runny mess. Too hot, and you’re left with near-edible charcoal (of course, if my mom had her way, she would eat onion rings this way. She already does with chicken wings and fish fillets). 6) Shaking the batter off the onions as you dip them in the batter isn’t really a necessary step, but it helps if you want the batter to adhere to the onion properly. Dusting the damp onions with flour before battering them will help the batter stick. 7) If you’re one of those people who has a gadget for everything in the kitchen, then a deep-fryer is your key to perfect onion rings. If you’re a traditional pots and pans type of home cook, then you can either go for the traditional straight-sided sauté pan or do what my mom has done for years and use a Dutch oven or a pasta pot (looks very much like a small sauce pot). You need something with a deep bottom since you will be free floating your battered onion rings as they fry. 8) Fry the onion rings in small batches. Crowding the pan lowers the oil heat and makes cooking last longer than it should. Of all the cooking techniques out there, frying is high and fast (like The Flash on marijuana). Five minutes is all it takes to get the onion rings done. You can leave them in a little longer if you desire a crispier outer shell or if they haven’t turned to golden brown in the five-minute cooking time. 9) One of the problems with frying is that the food comes out too oily. Let the finished rings drain on a paper towel-lined baking rack. 10) To keep onion rings warm (especially if you’re cooking a full meal), transfer drained rings to a baking sheet-lined pan to an oven preheated to 200 degrees Fahrenheit (around 93 degrees Celsius). 1. SOAK ONIONS: Place onion rounds, 2 cups beer, vinegar, ½ teaspoon salt, and ½ teaspoon pepper in zipper-lock bag; refrigerate 30 minutes or up to 2 hours. 2. MAKE BATTER: Heat oil in large Dutch oven over medium-high heat to 350 degrees. While oil is heating, combine flour, cornstarch, baking powder, ½ teaspoon salt, and ¼ teaspoon pepper in large bowl. Slowly whisk in ¾ cup beer until just combined (some lumps will remain). Whisk in remaining beer as needed, 1 tablespoon at a time, until batter falls from whisk in steady stream and leaves faint trail across surface of batter. 3. FRY RINGS: Adjust oven rack to middle position and heat oven to 200 degrees. Remove onions from refrigerator and pour off liquid. Pat onion rounds dry with paper towels and separate into rings. Transfer one-third portion of rings to batter. One at a time, carefully transfer battered rings to oil. Fry until rings are golden brown and crisp, about 5 minutes, flipping halfway through frying. Drain rings on paper towel-lined baking sheet, season with salt and pepper, and transfer to oven. Return oil to 350 degrees and repeat with remaining onion rings and batter. It’s a lot to do just for onion rings, but it only looks hard, and anything worth having is worth fighting for, especially if your enemy is the kitchen. Good night and good eatin’.